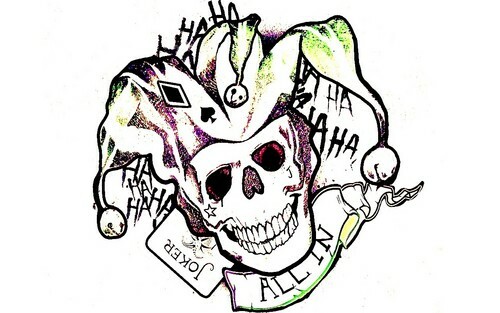 小丑. . HD Wallpaper and background images in the Suicide Squad club tagged: photo suicide squad 2016 movie film the joker joker tattoo harley's tattoo parlor promotional poster wallpaper desktop. This Suicide Squad wallpaper contains 红卷心菜 and 红球甘蓝. There might also be 动漫, 漫画书, 漫画, 卡通, and 漫画卡通.